The study guide is intended for the students of music faculties of pedagogical universities, studying the specialties “Education and pedagogical sciences”, “Art studies”, “Music art” and learning the course “Practical work with a choir”. The music material is chosen according to the aims of the consistent acquirement of practical working techniques and operating skills with a choir. “Chrestomathy” contains a cappella scores for female and mixed choirs with a soloist. The music material in “Chrestomathy” contains the music pieces of different levels and they are divided into two parts: “Music pieces a cappella for a female choirs with a soloist” and “Music pieces a cappella for a mixed choirs with a soloist”. 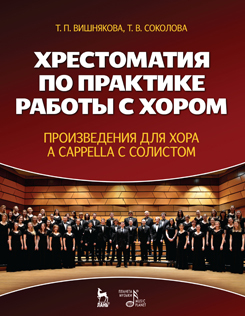 As a study guide for the course “Practical work with a choir”, “Chrestomathy”, together with the other music material, contains wide information about the authors and the history of creation of the music pieces. It also presents methodological recommendations for students, which provide more qualitative training for a future work with a choir. Except the usage at the lessons of practical work with a choir ,“Chrestomathy” may be helpful with the choice of a repertory for a choir while preparing for the State exam on choral conducting, and also with the choice of a repertory for children’s and youth choirs.